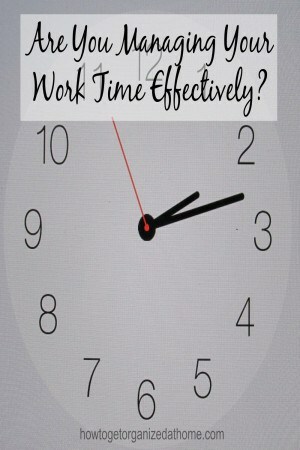 How you manage your work time is going to reflect on the amount of tasks you are able to complete. If you are the last one to leave because you struggle to get everything finished, then you need to consider managing your work time more effectively. If you are better at managing your time you will find that you can accomplish more and you can reduce the amount of stress that you are under. Stress makes it even more difficult to manage time, reducing the stress but possibly increasing productivity is possible. To start this process you must set clear goals of what you need to do and learn to break these down into manageable chunks, in relation to time and the actual task. By setting goals, you will have some focus to work towards, but if they are not realistic, you will find that you are unable to break these down into reasonable chunks. A realistic goal to aim for will have workable actions you can take to achieve the desired outcome. Small steps in a bigger project will enable you to manage your work time because it will keep you more focused and you will have the time to do the task effectively. It is important that you don’t procrastinate, this is where you put off doing a task or job; you might think that it is going to take too long or it isn’t a favourite task. Prioritize the tasks and tackle the hardest one first, this is great because it will mean that any task later in the day is the less taxing and this is often when you have other things on your mind, like going home. If you struggle with managing your work time effectively then try working out what tasks you will do and when, you might surprise yourself with the amount of work you can get done when you’re focused. You have the same amount of time as everyone else in your day, how you use it will depend on the amount you are able to accomplish. It is not about squeezing as much into your day as possible because this often leads to frustration and incomplete tasks. Aim to focus on the one task at a time and avoid temptation in seeking distraction from other sources, including social media. The most important task that you must do every day is to plan your tasks, know when it is lunch break and plan this into your day. Knowing what you are doing and when, is going to save you time in the end. This planning is something to spend 10 – 15 minutes on per day; you either do it first thing or last thing at night. Plan into your day some free time, this will allow for those unexpected meetings or an emergency that you need to deal with, then it won’t cut into your time already planned. Therefore, the most important thing you must do if you are looking to manage your work time more effectively, is to start managing it. If you don’t take action and plan your day to allow you to work effectively as possible, then you will find that you are not completing all the tasks which you need to do and this will increase the stress and the workload for the following day. This trend will continue until you start managing your time more effectively or you need time off work to deal with stress related problems. I’ve really got to remember to tackle the hardest task first. I am rather good at procrastinating on those things I don’t want to do. Oh my gosh, I needed this post! I work from home for a legal office, run two online businesses, blog, and will be back in graduate school come the Spring, and often times can just get away from me! By the way, my name is Niki, and I’m one of your fellow Merry Monday hosts, and wanted to let you know that I love your blog and hope to catch up on several of your other projects this week, too! Pinned! Have an awesome week!